U.S. Bancorp is one of the best bank stocks to own; it’s also one of the most expensive. High quality doesn't come cheap. Image source: iStock/Thinkstock. It's hard to say anything bad about U.S. Bancorp (NYSE:USB), one of the most profitable and prudently managed big banks in the United States. But the downside to such a sterling and well-deserved reputation is that shares of the Minneapolis-based bank have gotten to be expensive. 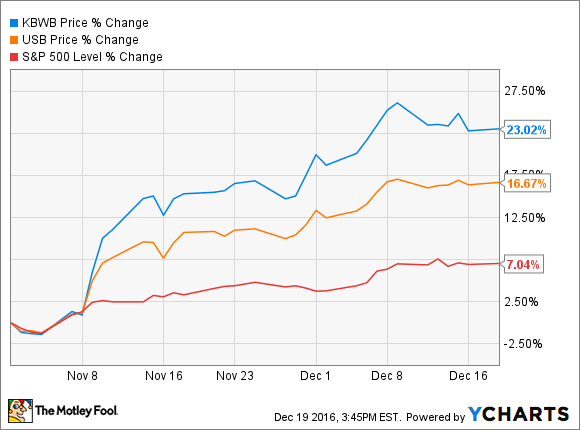 U.S. Bancorp's stock has gained nearly 17% since the beginning of November, with the presidential election serving as the catalyst. President-elect Trump's promise to reinvigorate the economy through tax cuts and fiscal expenditures, coupled with his vow to ease regulations in the bank industry, have convinced investors that banks will soon earn more money. This thesis is sound. One reason banks have struggled so much over the past eight years is because they're drowning under a sea of new rules and regulations. The Federal Reserve now requires banks to hold much more capital and keep their balance sheets much more liquid than they have in generations. And the upstart Consumer Financial Protection Bureau has caused banks to avoid any type of innovation or activity which, even in the absence of nefarious intent, could be interpreted as unfair or deceptive. Moreover, if the incoming administration gets its proposed tax cuts and infrastructure plans through Congress, higher inflation will almost certainly follow. This would incentivize the Fed to continue raising interest rates, which would translate directly into higher profits for banks, including U.S. Bancorp. But just because things are looking up for banks doesn't mean their stocks should be bought at any price. Herein lies the problem for prospective investors in U.S. Bancorp. In an ideal world, you want to buy bank stocks when they trade at or below tangible book value. That doesn't happen often; it's generally only the case in the wake of a crisis, as was the case in 2008. Additionally, a well-run bank like U.S. Bancorp will rarely, if ever, get that cheap even in the worst of circumstances. At the low point in its stock price following the financial crisis, U.S. Bancorp's shares still traded for 2.2 times tangible book value. A premium valuation like this makes sense when you consider that U.S. Bancorp's historical performance shows how safe of a stock it is. It also makes sense when you consider that U.S. Bancorp is the most profitable big bank in the United States. These are testaments to U.S. Bancorp's leaders, CEO Richard Davis foremost among them. Yet, there's a limit to how much investors should be willing to pay for any bank stock, even the best. And it's my opinion, as a shareholder myself, that U.S. Bancorp's stock has passed that threshold. Its shares trade for just under three times tangible book value -- 2.96 times tangible book value, to be precise. That's a hefty price tag buoyed by understandably high expectations for the bank industry. But the downside to such high expectations is that they leave little room for error or disappointment in the policymaking process. Maybe things will proceed perfectly as planned in Washington, but that seems far-fetched. Consequently, if you're looking to add U.S. Bancorp's stock to your portfolio, which would be a prudent move, then you might want to wait for a correction before pressing the "buy" button.